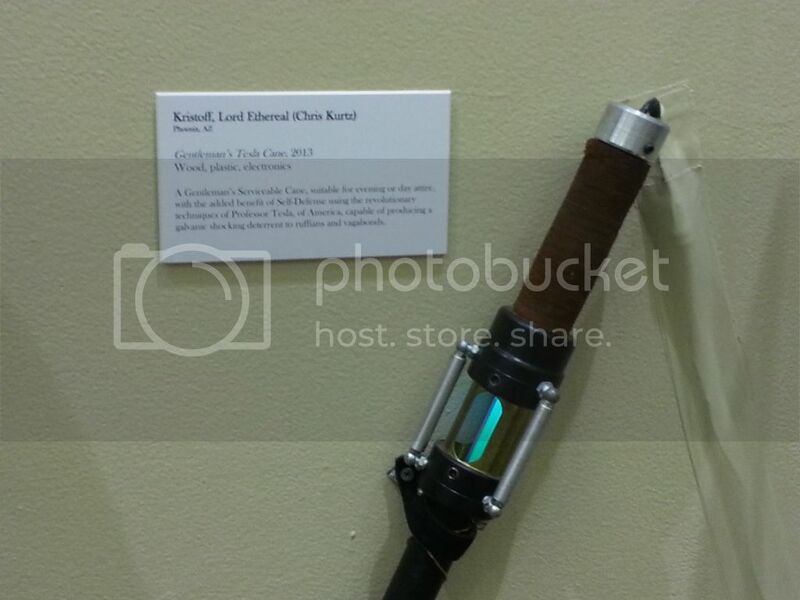 I’m in a Gallery Show! 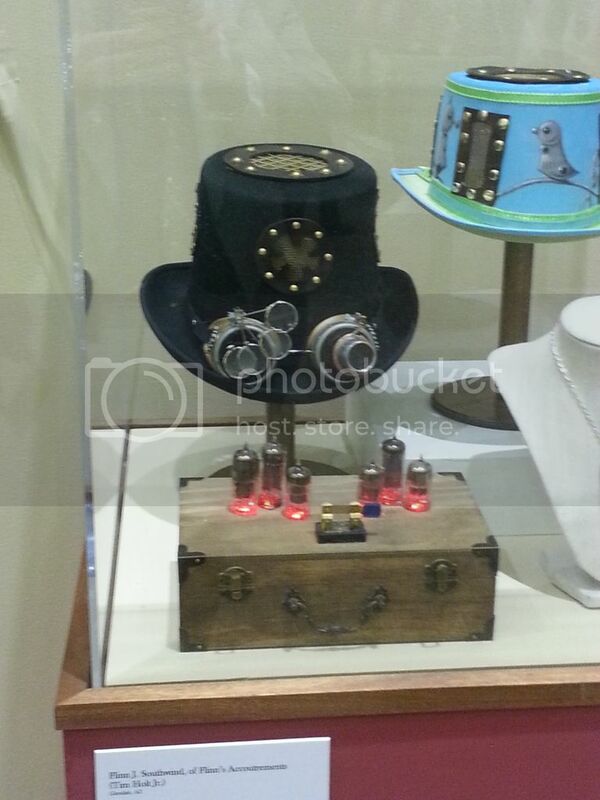 But first…I’m in a Steampunk Gallery Show! Those of you who know me know I’m not an artist — I can’t do any traditional art thing, but I (think) I have cool vision and ideas…and some others apparently agree! 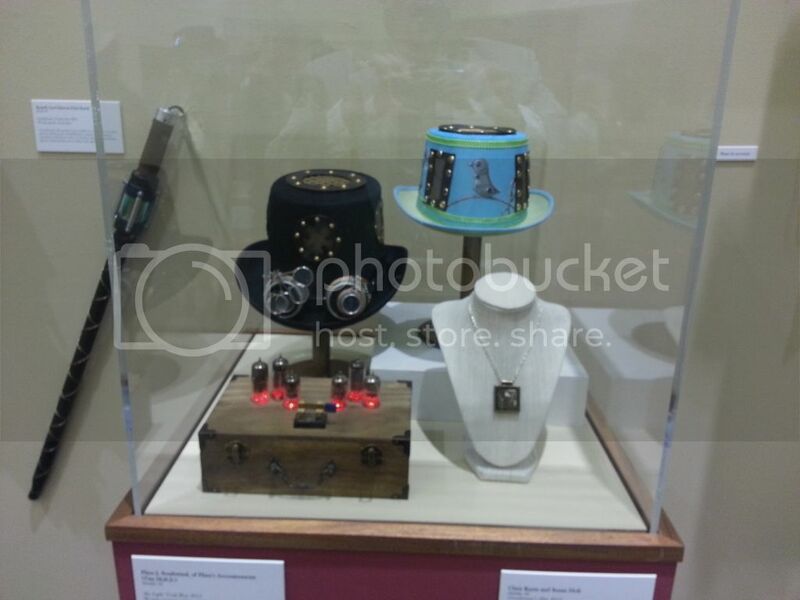 The City of Scottsdale Public Art project is putting on “Steampunk: The Exquisite Adventure” at their gallery in the Scottsdale Civic Center Library, and my Tesla Cane and Top Hat are on display through January 2014! Admission is free, and their are a lot of great artists represented (including The Artist Wife!) and I highly recommend you go see it! I haven’t posted in a while as I’ve been sidelined with tendinitis and my right wrist and thumb have been in a brace. Things are progressing, however! I’ve got a fair number of parts on order from ebay for some electronic stuff, and I hope to be doing some more shotgun shell testing this weekend. The purpose of this post is to share this video I came across on Youtube…the song really hits home with me with everything that has been going on, and the camerawork and cosplay in the video (shot at the London FIlm & Comic Con) is awesome! Watch it! Then watch it again! Ok, I hate this analog to digital stuff. I just can’t get it to work. I should have written down the EE’s scribblings, too. As I said in talking about my remaining inputs I need a total of 11 pins (8 inputs: 3 buttons, 2 rotary encoders (each uses 2), 1 rotary encoder button and 3 outputs: the button LEDs) and I have just that many, with no expansion room. I happen to have a SIPO (Serial-In, Parallel-Out) 74HC595 Shift Register IC that will let me control the 3 LEDs with 3 pins (thats a wash, I know) but would give me 5 more outputs if I needed them. There are also PISO (Parallel-In, Serial-Out) 8-bit shift registers that would let me combine the 8 inputs into 3 pins as well, or if I needed I could daisy chain a second shift register to get another 8 inputs. Apparently there are also programmable shift registers that do both SIPO and PISO, but they appear to only be SPI (Serial Peripheral Interphace) and the Nano MP3 shield appears to be using those pins. I wonder if its only those pins? I originally started this blog to document my adventures in steampunk, but a recent project led me down a path I’ve thought about a lot, but never done: electronics. I’ve always wanted to learn more about building electronic circuits and especially I’ve been intrigued by an open-source microprocessor project called Arduino which can be used to control all sorts of electronics. So I’ve morphed this blog into a general projects blog and have moved it to a more general url (https://projects.xoff.org) as well. For the last 22 years, I’ve been a member of a medieval recreation group…well, recently it was time for a change. Recently a good friend announced that they were getting married and that the wedding would have a Victorian/Steampunk theme. I have to say that I wasn’t the only one of our friends who almost literally jumped for joy at the chance to do a Steampunk costume with a real purpose and timeline! This blog will serve as my online notes and thoughts about doing steampunk (re)creation, with possibly a number of guest bloggers who are also designing Victorian and Steampunk outfits for the wedding.